To continue with the touristy activities from the past couple of days, yesterday I also went to see Joseph and The Amazing Technicolor Dreamcoat. I wasn’t that much into Any Dream Will Do (I watched it, but couldn’t really care less who won), but my mother and sister were, so I had gotten them tickets. We had front row seats on the Upper Circle, certainly not the best, but still not too shabby. “Wow”. That’s how I came out of this musical. Not a “Wow! That was a great!”, but more of a “Wow. That was… weird.” I’m completely convinced now that Andrew Lloyd Webber wrote this musical when he was high; Joseph and The Amazing Technicolor Dreamcoat is just a bizarre jumble of musical styles strung together as a musical. I wasn’t familiar with Joseph at all. I kind of know the biblical story and I knew the two main songs from Any Dream Will Do, but for the rest I had never seen or heard anything about it. Those two songs (‘Any Dream Will Do’ and ‘Close Every Door’) I actually like, but the rest just felt weird. Let’s put it this way: there’s one song that’s a sort of country & western “yee-ha” song. There’s another song sung with a french accent. Then there’s a Jamaican blues-like song. Another song is sung by a camel and a snake (no, I am not kidding). 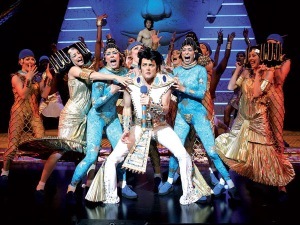 Then the Pharaoh is literally The King, as in: Elvis. It’s just a strange mix of all different genres. And then there’s Lee Mead. For the non-UKers, Lee Mead was the winner of Any Dream Will Do, an American Idol-like tv talent show in search for a new star for on the West End. He plays the titular character Joseph, but unlike the previous talent show winner of How Do You Solve A Problem Like Maria? (Connie Fisher) he doesn’t have to carry the whole musical on his shoulders. The two songs from the tv show are the two songs he gets to sing. Oh, he sings along a little bit in three or four other songs, but it’s not a lot. 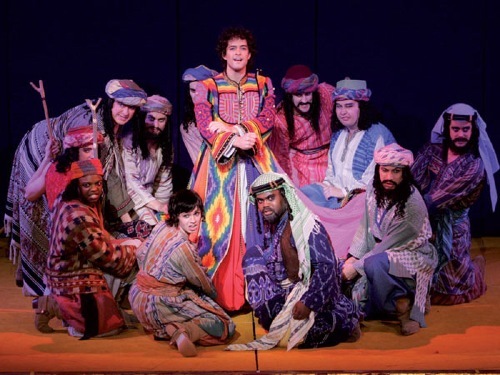 The narrator for me is the real star of Joseph; she (or in some productions he) sings and act/dances in practically every scene and vocally has the most difficult parts. To be fair though, Lee Mead was great as Joseph and he sang the songs perfectly. I’m just a tad disappointed he didn’t get to do more. I am a musical lover, but Joseph and The Amazing Technicolor Dreamcoat just didn’t work for me. This is the first Andrew Lloyd Webber musical I’ve been to, so maybe it’s just his musicals that don’t do it for me (although I do like The Phantom of The Opera songs, even though I’ve never seen an actual production of it). Don’t get me wrong, I did enjoy myself, especially during the after-finale megamix. It’s just… typically when I like a musical the songs get stuck in my head and I yearn to back in the audience again, seeing and hearing all the songs all over again. Here though that didn’t happen and apart from those two great songs the rest of Joseph is just a bizarre, weird show.